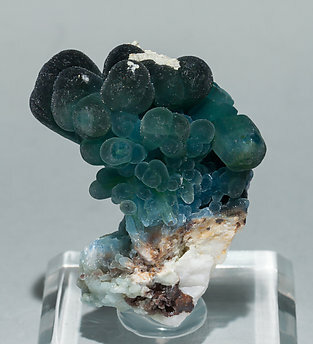 Botryoidal Plumbogummite growths, with velvety surfaces and a very deep and intense blue color, coating a matrix of yellow Pyromorphite crystals. Due to the softness of the surfaces the sample has some small whitish points produced by light scuffs. 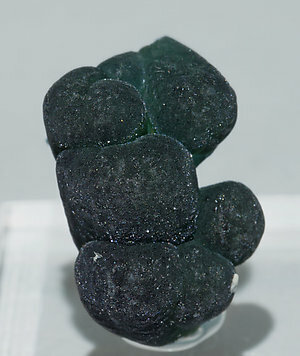 Both the Plumbogummite and Pyromorphite have been analyzed and we will send a copy of both analyses to the buyer. 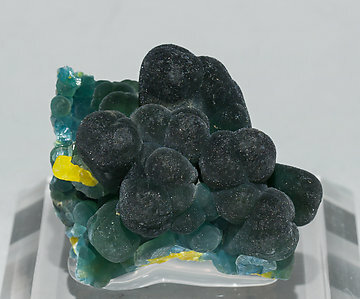 Botryoidal Plumbogummite growths, with velvety surfaces and a very deep and intense bluish-greenish color, coating a matrix of yellow Pyromorphite crystals. Due to the softness of the surfaces the sample has some small whitish points produced by light scuffs. Both the Plumbogummite and Pyromorphite have been analyzed and we will send a copy of both analyses to the buyer. 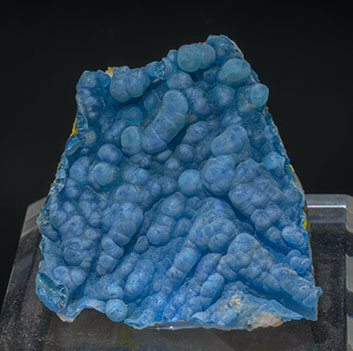 Translucent botryoidal Plumbogummite aggregate with a uniform clear blue color and free of damage. 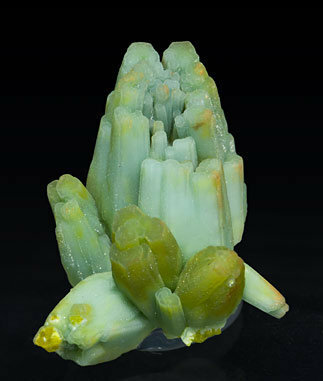 It is on Quartz with yellow Pyromorphite impregnations. 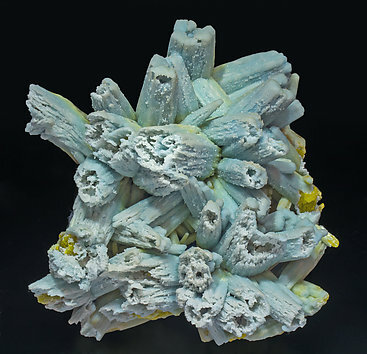 Divergent aggregates of very large Pyromorphite crystals with very well defined skeletal terminations, coated and almost completely replaced by pale blue Plumbogummite. The sample has been analyzed and we’ll send a copy of the analysis to the buyer. 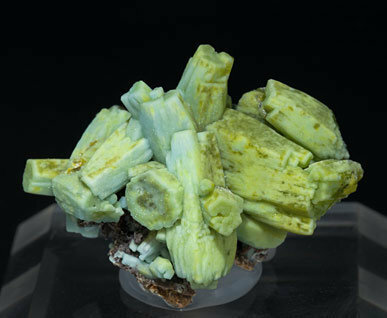 Aggregate of elongated Pyromorphite crystals forming parallel growths, with a yellowish-green color and coated by bluish-green Plumbogummite with yellowish shades in some zones. 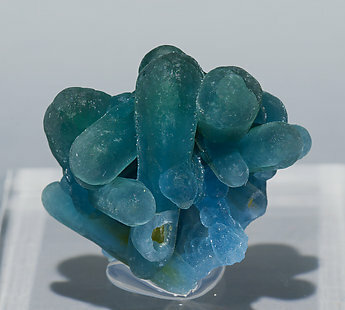 Both the Pyromorphite and the Plumbogummite have been analyzed and we will send a copy of the analyses to the buyer. 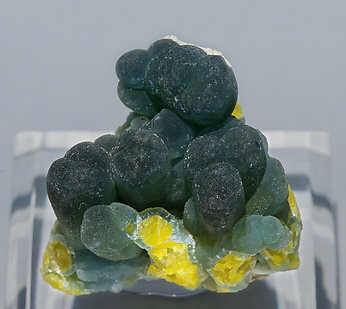 Aggregate of Pyromorphite crystals with parallel growths and slight curvatures on their faces and edges, with a yellowish green color and coated by bluish-green Plumbogummitewith yellowish shades in some areas. 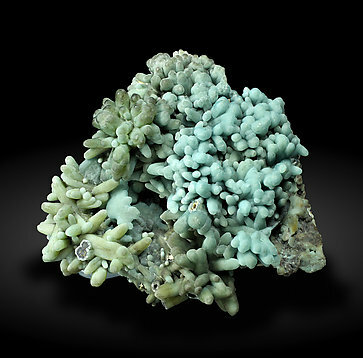 Both the Pyromorphite and the Plumbogummite have been analyzed and we will send a copy of the analyses to the buyer.